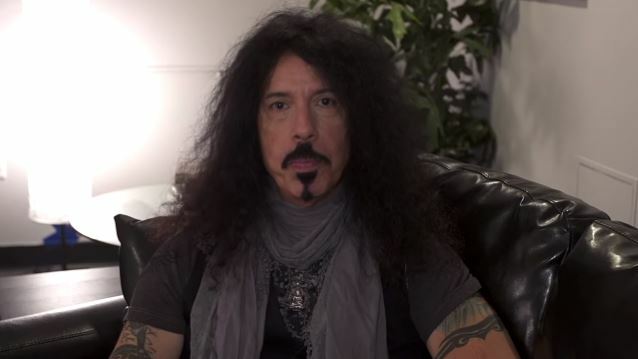 In a brand new interview with The Washington Times, QUIET RIOT drummer Frankie Banali was asked to recount one of the best "Spinal Tap" moments from the band's early days. He said: "When we were doing our first headlining tour in 1985, we had a gigantic set built. Because now we had to compete with the VAN HALENs of the world. The set was three tiers. The top tier the guys could walk on. There were these three elevators. They spent tens of thousands of dollars on the set, yet the elevators were powered by Black & Decker drills." He continued: "In theory, what was supposed to happen was the intro song ends and I start playing 'Sign Of The Times'. I'm playing, I hit the downbeat, and pyro goes off, and at that point the guys are supposed to be standing on top. I'm sitting there [playing]. Pyro goes off. And I'm waiting to see the guys. Nothing. I see people pointing. I turn around, and all I see are what looks like severed heads because that is as far up the elevators got. I just busted out laughing. Then they were trying to crawl out with their instruments. It was hysterical." In addition to Banali, QUIET RIOT's current lineup includes singer Jizzy Pearl (LOVE/HATE, L.A. GUNS, ADLER'S APPETITE, RATT), bassist Chuck Wright and guitarist Alex Grossi. "Quiet Riot: Well Now You're Here There's No Way Back", the feature documentary on QUIET RIOT, was released last year. It is described as an inside look at Frankie's road to recovery after losing his best friend Kevin DuBrow to a drug overdose in 2007 as he forges ahead to conquer his loss, regain his life and put the band back together.